NOTE For tasks related to this tool, see About the Pencil Tool. The following properties affect the pencil's size, smoothing, shape and other properties for the drawing style of your pencil. Those properties can be saved into pencil presets for later use. NOTE Using the Select tool, you can select and remove a segment of flattened pencil lines. Overlapping pencil lines drawn with the Auto-Flatten mode are essentially cut into segments by the overlap and can be treated as individual lines. 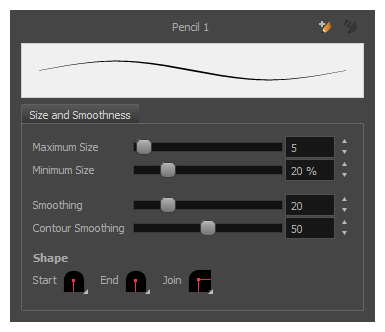 Pencils have extra parameters which are not accessible from the Tool Properties view. 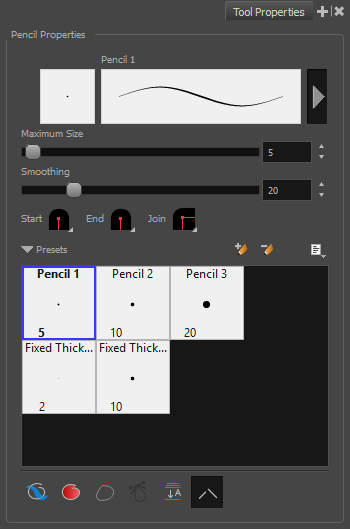 To open the Pencil Properties dialog, click on the arrow button right of the stroke display area.